Pioneered by David in 1989 shortly after his research journey to Egypt, Quantum Sound has been developed and sophisticated into a powerful therapeutic instrument capable of vibrating body tissue, cells and even further down into our molecular building blocks. With the known frequencies of the chakras energies, a harmonic resonance is created at the core level of DNA molecules, allowing them to re-establish the right vibration for healthy cells. This is a yogically developed procedure so it includes deep rhythmic breathing (Mahat yoga pranayama), as part of each session. While cells are being moved and shaken by the vibrations, they are also being supplied with oxygen and relieved of their carbon dioxide and other toxins. In this way the metabolic chemistry is brought back into good balance in all cells within the glands and organs, leading to peak performance in those body parts. Modern studies in biology show that cells are always in a state of vibration while at their molecular level the frequency of that vibration goes beyond trillions of hertz (cycles per second). The cell membranes and its receptors are vibrating at billions and trillions of cycles per second. Many octaves below that we can create harmonic resonance and induce it into the cells of glands and organs. Quantum sound therapy penetrates into the quantum field of cells and adjusts vibrations according to the chakra frequencies, each chakra having its influence on specific cellular functions. The result is better glandular and organ efficiency because the cells within are in better condition and cooperating harmoniously. These sessions are designed to enhance the function of the endocrine glands that regulate our body chemistry through hormones. While doing this the client can experience a variety of emotional states, or as more commonly expressed - have periods of emotional release. these sessions can be progressive and go towards overcoming past trauma. The prescription session takes into account the individual frequencies of the active and dormant chakra energies of the client to move through blockages which are creating physical, emotional or mental disturbances. Personal guidance through the process is part of the package and the price varies depending on your needs. Quantam Sound and Light therapy is the synchronization of the pulsing lights tuned to the frequency of the sound, producing active stimulation of the pineal gland and hypothalamus, altering brain chemistry towards higher consciousness. One recent theory in science attempting to explain the sense of smell states that it is the signature frequency of a molecule that determines the interpretation of what we are smelling. A rose molecule has one specific vibration and a coffee molecule has a very different song. It is not just one specific frequency, but as each atom within the molecule has its one rate of vibration, together these atoms make a mini symphony, which makes up the signature song of that molecule. Keep in mind that modern science is highly theoretical and there is nothing proven about the nature of the reality in which we live. Regarding frequency, we have some known facts, such as with our ears we hear the frequency of sound waves pulsating through the air and our mind interprets this as sound. With our eyes we detect the frequencies of a very small segment of the electromagnetic spectrum and interpret this as colors of light. What about feeling ? If we stand in front of the subwoofers at a rock concert and feel the bass – that is also feeling vibration. The senses of hearing and feeling merge at this meeting point, to create emotional as well as sensual experiences. 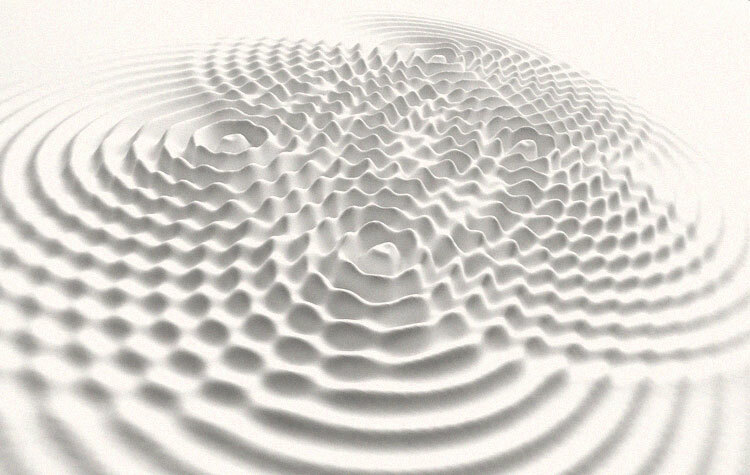 In these two photographs sound is moving the sand particles into a geometric shape that is quite symmetrical. In a similar way harmonic sound waves traveling through our cells can arrange the molecules inside the cell into moving/dancing patterns which have very positive effects on cell health.